San Francisco journalist Herb Caen once said that heaven “was a place that resembled Sonoma,” and we can’t argue with that. The undulating terrain, sun-soaked vineyards, and foggy mornings along the coast make Sonoma County a place of striking beauty. This region in Northern California is known first and foremost for its wine — widely regarded as some of the best in the world. But those who come for the tastings tend to stay for the history, the natural escapes, and the many unique-to-Sonoma experiences. We’ve put together three itineraries that will show you the best of this stunningly beautiful corner of the globe. Each is a weekend-sized foray into Sonoma’s dynamic culture — but know that you don’t have to choose just one. 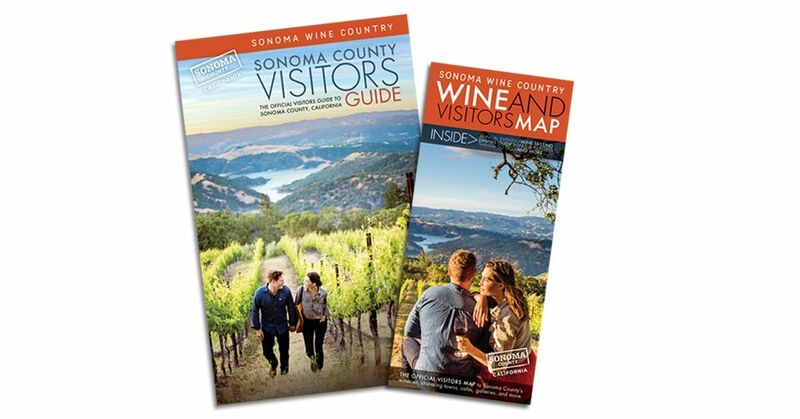 This guide is proudly produced in partnership with Sonoma County Tourism. Download the Official Visitors Guide. The city of Sonoma was the site of the 1846 Bear Flag Revolt, a brief skirmish that resulted in California being declared a republic for 25 days. Today, this rebellious spirit and deep love of the land remains. Some say you can taste it in the wine, but it’s easier to pick out in the city. Buena Vista Winery has existed since 1857. 1857! Long before Sonoma was the world-famous wine region that it is today. Founded by an eccentric entrepreneur named Agoston Haraszthy — who declared himself “The Count of Buena Vista” — the winery is now a California Historic Landmark. A visit here could mean touring the museum, strolling the gardens, peeking at the historic buildings, or even scheduling a private sparkling wine tasting in the Historic Press House Tasting Room. And we’re not even going to tell you about the caves. Sonoma Plaza, anchored by the historic Mission, provides a crash course in the history of the Golden State. It’s also the largest plaza in California. Today, its old army barracks and the Mission are open as museums, both dedicated to exploring the region’s roots as Mexican territory — and before that, native land. At the center of the plaza is City Hall and its verdant park (decorated beautifully at Christmas), all surrounded with adobe storefronts and cafes that open out onto the cobblestones. Keep an eye out for the massive LOVE sculpture, an ideal Sonoma photo opp. The Fairmont is peak wine-country luxury. But the yoga classes, hiking, and golf course aren’t even the main draw — what makes the Fairmont unique is its spa, which sits on a thermal mineral spring. There are four different geothermal pools on the property, and they all possess a certain meditative, timeless atmosphere. Glen Ellen is Sonoma’s much smaller, quainter cousin — the village is as idyllic as it is tiny, and the Benziger Family Winery is one of its best spots. Founded by the well-respected Benziger family (surprise! ), the winery was one of the valley’s first organic and biodynamic winegrowers. There are a variety of tour options, some of which include a tram tour of the biodynamic vineyards, tastings in the winery’s wine cave, and even “lunch with a Benziger family member.” The family also founded the nearby Imagery Estate Winery, where lesser-known varietals are paired with beautiful art — every label is designed by a different artist. Petaluma, one of the fastest growing cities in the North Bay, has a thriving farm-to-table culture, and artisan cheese is one of its signature products. At local Achadinha Cheese Co. — which focuses primarily on blended goat’s and cow’s milk cheeses produced via sustainable practices — you can take classes in cheesemaking, fueled by lots of sampling throughout. Eat cheese, make cheese, bring home the cheese. And repeat. Photos provided by: Sonoma County Tourism, Alexander Rubin/Buena Vista Winery, Sonoma County Tourism, Benziger Family Winery, and Briana Marie Photography/Achadinha Cheese Co. In northern Sonoma County, you can listen to classical music, eat like you’re in first class, see real-life Academy Awards…and go on a safari? 100%. The “Sonoma Serengeti” is just one spot on this itinerary that spans the best of the north. Safari West is locally famous in Northern California — if you had 800 animals roaming your 400-acre preserve, you’d be famous, too. The unique wildlife reserve, which bills itself as the “Sonoma Serengeti,” has 90-some species, including giraffes, rhinos, gnus, cheetahs, zebras, wildebeest, and impala. “Safaris” involve hopping on a Jurassic Park-like Jeep and being guided through the preserve. You can also schedule a “wild encounter” and see some of the animals up close, or book at stay in the cottage or go glamping onsite. Consider it a good omen if a giraffe licks your window. While you’re in the area, be sure to take in a world-class performance at the Green Music Center in Rohnert Park. This is the performance hall of Sonoma State University, but it’s also home to the Santa Rosa Symphony, and it brings in artists from around the country. The focus is classical music, but you’ll find festivals and entertainers, too. Pro tip: The back wall of the center’s 1,400-seat Weill Hall opens up onto the lawn in the summer, providing a uniquely Sonoma music experience. Catch this if you can. Francis Ford Coppola is known mainly as an Academy-Award winning film director (you might’ve heard of The Godfather), but he also owns a beautiful winery estate. Here, visitors tend to linger to sample the 40+ wines, play bocce and board games, and chill on the pavilion. For the record, the estate is also kid-friendly — it has a pool, restaurants, and a movie memorabilia gallery that features some of Coppola’s awards. The Barlow brings “shop local” to a whole new level. The 12-acre outdoor market district features local beer, wine, spirits, food, and artisan crafts, all done Sonoma-style. It’s basically a mini-downtown that doubles as a foodie mecca. SingleThread is a once-in-a-lifetime type of restaurant experience you just won’t find anywhere else. They serve an eleven-course tasting menu, custom made for each night’s guests and prepared with food and wine from the nearby farm. And they just so happen to have three Michelin stars. Beautifully crafted, fresh food is something that Sonoma County takes very seriously (you’ve probably noticed), and you’d be remiss to visit the region without experiencing SingleThread, one of the purest distillations of this ethos. Santa Rosa’s old town, once defined by its railyard (and macaroni factory), is now a vibrant shopping district full of local shops and restaurants — which just so happen to have held onto their brick-lined, 1870s roots. Center yourself here, and you can’t throw a rock without hitting somewhere worth stopping. In the 21st century, a new kind of train has come to town. Railroad Square has been reborn as a transport hub thanks to the new SMART train, connecting Sonoma and Marin Counties. Sonoma is one of the largest counties in California, and it packs in much more than wine country. You’ll also find majestic redwood forests and a wild coast that’s held onto its ruggedness (think dramatic rocky cliffs). Sonoma’s particular brand of natural escape won’t disappoint. AutoCamp Russian River was born when Airstream’s Instagram set up shop in the woods. At least, that’s how it might seem. This spot is more “retreat” than “campground,” where you sleep on a memory-foam mattress in a remodeled Airstream (stocked with Malin & Goetz bath products), hang out in the mid-century clubhouse, grab local wine from the onsite shop, and walk to the river through a redwood grove. Your grandpa would be some combination of amazed and appalled. You’ll find this oasis in Guerneville, right on the banks of the Russian River. Be sure to stop by the “adventure desk” to find out all there is to do. Founded in 2008, Thomas George Estates specializes in Pinot Noir and Chardonnay grapes, which founder Tom Baker believes grow better in the Russian River Valley than anywhere else in the world. No one yet has proved him wrong. You can take a private tour of the winery to learn about their practices and to explore the downright beautiful facility — but ideally, come in the summer to go on a “Wine Safari” up into the vineyards. The best way to see Sonoma County’s redwoods might be from 200 feet in the air — at least, that’s what anyone at Sonoma Canopy Tours will tell you. The nonprofit eco-tour company offers a variety of ziplining options, including a unique night-flight experience where you can cruise along seven ziplines during sunset or under the stars. Venture north on scenic Highway 1 and you’ll eventually find yourself in The Sea Ranch. It’s a planned, unincorporated community — with fewer cattle than you’re probably imagining. The folks here chose this 10-mile stretch of Sonoma coastline very deliberately, and now it’s a popular vacation (and adventure!) spot. Unbeaten Path does one-of-a-kind tours here, including an architectural tour of The Sea Ranch and Salt Point region. There’s also a forest-to-coast connection tour that includes meditation, forest bathing, and mindfulness walks. Yoga in the woods? That, too. Sonoma Coast State Park, abutting the Pacific due west of Santa Rosa, is breathtaking. Rocky arches and steep cliffs wrap the shore, and on sunny days the water is a dazzling aquamarine. Even in the fog, the wildflowers clinging to the shore add plenty of color. It’s an amazing place for a hike, no matter what your experience level — there are both easy strolls and advanced treks here. A simple picnic might also do the trick in showing you a different side of Sonoma County.